I met Loren Stephens through this blog and my twitter. It happens that we only live a few miles away. I have only ridden once with Loren, on his recovery day, as I am rarely in good enough shape to even see his wheel. I am thoroughly motivated, and encouraged by what he has accomplished mentally and physically since his open heart surgery and heart attack. He is committed to not let his heart stop him from once again becoming a cycling champion. He wrote his account of hat happened to him below. I am an elite level masters cyclists in the USA. 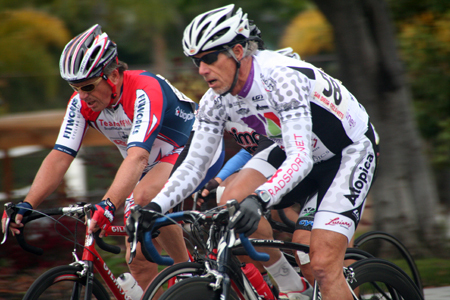 I have earned many podium finishes in masters time trial and criterium and am a past California State Masters Criterium Champion for 65+ men. I was diagnosed with degenerative mitral valve disease (60% leakage) in April 2010. On July 1, 2010 at UCLA Ronald Reagan Medical Center I had a 7.5 hour open heart surgery to repair my mitral valve and to do an atrium reduction. My heart was removed from my body in order to make the repairs. I spent 5 days in ICU and a total of 7 in the hospital. After getting out of the hospital I struggled with some A Fib problems. I ended up having to be cardioverted out of it. I have been AF free since. I was able to start training on the bike in September 2010. In late September I had a ventricular tachycardia event while riding and passed out cold. My Doc said I was lucky to be alive and took me off the bike and put me in cardio rehab. After cardio rehab I was given the OK to start training on the bike again in preparation for the 2011 racing season. I was making great progress until February 15, 2011 when I had a heart attack on a training ride. After a stent and few days in the hospital I was out and found myself back in cardio rehab. After completing rehab I was given the OK to start riding the bike again. I have been riding mainly to gain back my old levels of endurance. In December 2011 I started working with my long time coach again and started full on training in preparation for racing USA Cycling Masters Nationals in early September 2012. I have no restrictions other than the fact that I’m on Plavix which will limit my racing for the first half of the 2012 season. I have raced a couple of races just to test my fitness. In June I raced the California Senior Games and came in 2nd in the 40K road race which also qualifies me to race at the 2013 National Senior Games in Cleveland. My next races will be USA Cycling Masters Nationals in early September 2012 in Bend Oregon and the Huntsman World Senior Games in early October in St. George Utah. Not bad for a guy who was told he would never race again. I proved them all wrong. You can follow Loren’s twitter here and his blog and coaching website here.